New forms of poverty across Europe are affected by the demographic behaviour of individuals exposed to risks of material deprivation and social exclusion and those who have fallent through the safety net of the social welfare systems. To introduce appropriate policy measures, policy makers need accurate information about the demographic factors likely to have an impact on social exclusion, such as patterns of young adults leaving the parental home, household dynamics, couple formation and dissolution, reproductive behaviour, morbidity and mortality of individuals and groups which are either at risk of social exclusion or already excluded from society. This volume is an international study consisting of an executive summary followed by eight chapters dealing with concepts, data and methods as well as with the different aspects of social disadvantages. 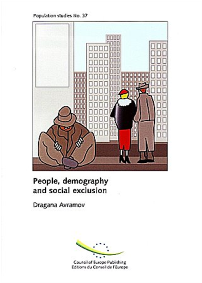 It includes numerous tables and graphs, and provides exhaustive information on the relationship between social exclusion and demography.